Would you like to travel the world, but would rather get help from an expert that has done it before? We can coordinate homestays and cultural experiences for the regions of the world that you are travelling to. That way, all you need to do is pay for the trip without having the hassle and stress of planning and organising the trip. Here are a few things that we can help you with. Activities to do and experience. You have a few package options available. We can even help you earn an income before you head abroad. If you would like to learn more, get in touch with us today. I do love the freedom of being location independent. However, there are positives and negatives to everything. There are certain things with the digital nomad lifestyle that affects the productivity with the work that you are doing. It’s good to be aware of this and to work out a work-life balance that will allow you to achieve what you want as an income, as well as with the travelling lifestyle. From my personal experience, here are a few things that you need to keep in mind. You need to be in a productive working environment. If you really want to be productive, you will need the following type of environment. Avoid working in areas with alot of distractions. 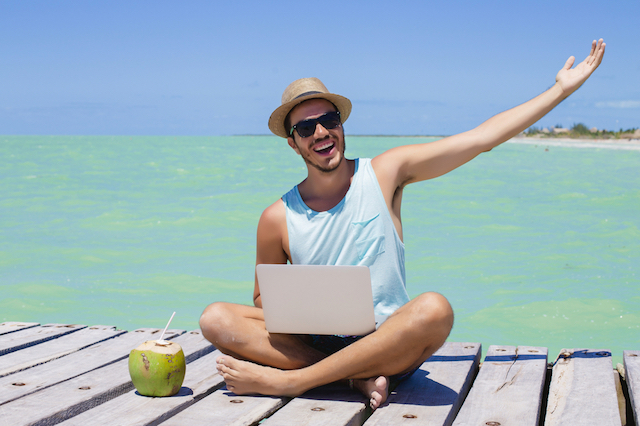 There are several digital nomads who post Instagram pictures of themselves working on their laptop at a beach or in front of rice fields. As good as it sounds, it often isn’t practical. I’ve tried working at the beach and it is difficult to be productive when the sand is blowing on you or you try to look at your computer screen and the glare from the sunshine affects what you can actually read on the screen. As for the rice fields, many of these nomads work in a cafe that overlooks the open field. They fail to tell you about the mosquitos and sometimes the patch internet or discomfort of the chairs. Even if you decide to work in a cafe, you may experience something similar. And if you are on a public Internet network, there can be security risks or even a lag time with the internet connection. Natural light is best. But if you have access to LED artificial lighting that is well designed, it will also help you improve your alertness, which will directly impact your productivity level. Not all internet providers are created equal. I personally go for the quickest internet provider available (currently 5G), as it allows me to complete my tasks without delays. When travelling, there are places that advertise an internet connection, however it is so slow that you cannot be productive. Check the Mbps to see when you can. When you want to be productive, you need to minimise the distractions around you. Many digital nomads recommend working in coworking spaces. I personally find these environments very distracting. It is better to get a private room or to work in the room of your accommodation. That way, you can completely focus on the task at hand. It’s a bit of a juxtaposition. You can travel and explore, but aim to base yourself in a location for at least 5 days. This will give you time to balance your travels with your working schedule. It will also minimise the amount of time that you will lose when in transit. Before starting your digital nomad lifestyle, make a note of the things that allow you to be productive and see how you can successfully incorporate it during your digital nomad journey. How to perform better at work. 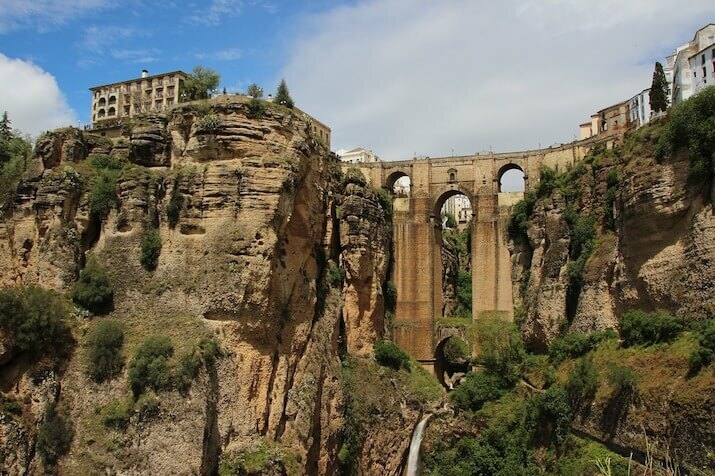 I travelled to Seville for ‘La Feria‘ and also wanted to see what the city had to offer. I’m not a huge fan of big cities nowadays, so I decided to only stay there for a few days. I was impressed with the city and found it interesting. 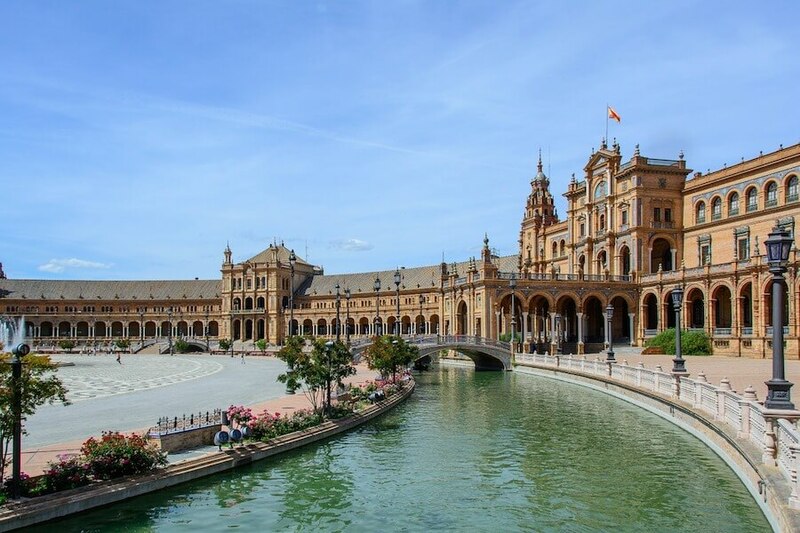 I definitely think that if someone wants to have a Spanish city experience, then Seville should be considered. I did notice the language/accent was different compared to say, Granada. I felt like people were speaking really quickly. But it did feel like a nice experience. You can easily jump onto Airbnb and find accommodation. Just beware that if there are major events like the Feria happening in the city, you will need to book your accommodation in advance so that you can secure the room. I was looking at places for about $40 a night. I actually ended up staying outside of the city centre in a suburb called Tomares, which was much quieter. There was a bus stop close to my accommodation and it was a 25-minute journey into the city for 1.60 Euro each way. However, it wasn’t close to the shops. I did a homestay whilst I was there and I felt that I had a much more authentic experience because of it. If you actually stay within the city centre, it is very easy to get around. I was walking around the city, but you could easily jump on a bus if you wanted to. You can drive, but as with most major cities, finding a car park will be difficult. It costs more to live in Seville. Eating at home with groceries is your best bet. But you can enjoy the bocadillos (sandwiches) for a fairly inexpensive price whilst you are there. Tapas costs more there, but it is still affordable. You can also opt for simple meals such as a Spanish omelette. I mainly enjoyed myself in the city centre, where there are plenty of shops, cafes, bars, restaurants and historical buildings. There’s also a strip where all of the nightlife happens as well. Here is a short Instagram video that shows my experience in Seville. It’s worth considering Seville as a destination. Have you been there? Let us know. There’s a certain charm about this city that has intrigued me. As a digital nomad, I want to fulfil my curiosity to travel to destinations and awaken my mind, whilst being able to accomplish my work in the digital space, whilst working from a remote location. The things that I typically look for include living costs and lifestyle. Even though I’ve only been in the city for a short amount of time, I can say that I am experiencing both. I’ve personally been able to live in France and the UK. I’ve also travelled through the south of Spain. I can see elements of each city and Portugal’s own unique culture and lifestyle, which makes this city attractive. How was the internet connection? The accommodation costs were quite surprising. In Australia, I pay $420 a week in rent, which works out $1680 per month. I generally aim to keep my accommodation costs at $1000-$1500 a month when I am travelling. If you travel over the long-term, you will find deals on Airbnb that will allow you to receive discounts so that you will be able to stay in the city at rates that are similar to what the locals pay. I was able to find accommodation in Lisbon fairly easily. The city seems small in certain areas, but it can be spread out in others. That being said; there tends to be fairly good transportation links to different areas in the city. Getting to and from Lisbon itself seems to be quite straightforward. 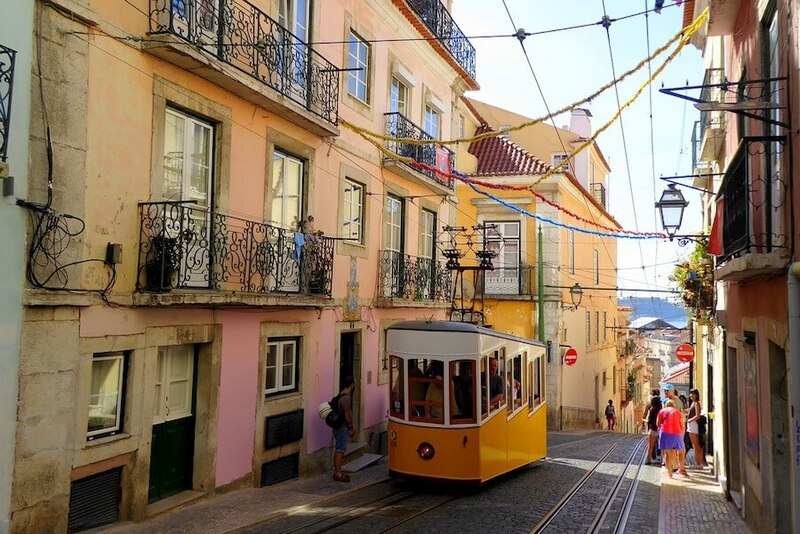 You can get to Lisbon easily by plane (the airport is approximately a 20 minute drive from the city), train and by the intercity bus. Once you are in Lisbon, you have the following options with transportation. There are several taxis in service in and around the city. Taxis always tend to be the more expensive travel option, however they aren’t as expensive as in other cities. The bus was fairly inexpensive and relatively frequent, but it was necessary to plan in advance. I would recommend installing the Citymapper app so you can plan your journey in advance. The app will also show how soon the bus will arrive and track your station progress, which is handy if you don’t understand Portuguese. The tram is iconic to Portugal. It isn’t the cheapest form of transport, but it definitely makes it more convenient to get from one side of the city to the other, especially given the amount of hills that you need to navigate in the city. It can be one of the quickest travel options whilst you are in Lisbon. There are 4 metro lines that you can use to get around the city. The green line and the yellow line. The cost is 1.45 Euros one way. We actually found it cheaper and more cost effective to hitch a ride with an Uber. Even though you are in Portugal and the local language is Portuguese, you can get by using English. If you speak another language such as Spanish or French, it is possible to get around using those languages as well. I’d struggled to find authentic Portuguese food, but my sister actually put me onto the TripAdvisor app that suggested restaurants in the local area. I can say that after using the app, we were able to enjoy some really tasty and authentic Portuguese food. I would definitely recommend trying authentic Peri Peri chicken whilst you are in Portugal. You can also pick-up very affordable food such as pastries in the supermarket. We purchased pastries and breads from 0.20-1.00 each, depending on what they were. (Croissants were 27 cents, which was great for breakfast). I was surprised at the amount things that I was able to do. However, my interests are mainly exploring aesthetically interesting environments. This is something that I felt Lisbon offered. Additionally, there are a few options for nightlife such as going out in the Barrio District. There are several bars for wine, tapas, and dancing. There are also free walking tours around the city (where you can offer guides a tip at the end). However, it is easy enough to walk around the city and find the local landmarks. We were able to see them over 2 days. If you would like an extensive guide, purchase the Lonely Planet guide on Lisbon or Portugal (if you plan to travel around the country). This was the only thing that concerned me a bit. Even at the accommodation where I stayed, the internet connection wasn’t the best. But I could still do what I wanted to do while I was there. At some of the cafes, I had a similar experience and had to work offline. But if you can find those cafes with a good connection, you can easily spend less than 2 Euros on a coffee and enjoy your time working on your laptop whilst people watching or adoring some of the sights that Portugal has to offer. Lisbon isn’t going to be as cheap as places such as South-east Asia, but it is affordable. The level of comfort varies as well. If you are in the position to spend $70-100/night, then you will be able to live fairly luxuriously in Lisbon. But I’d even go as far to say that the city can be done on a tight budget of $50-60 Australian dollars a day (Or less if you are travelling as a couple). Have you stayed in Lisbon before? What do you think? *Note – This post contains affiliate links. However the opinions and experiences are my own.